Article first published as DVD Review: Louie – The Complete Second Season on Blogcritics. 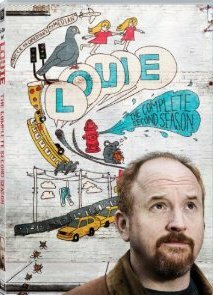 Season 2 of Louie is now available on DVD. The show is a glimpse into the life of comedian Louie C.K. It’s not a reality show, but the stories are based on C.K.’s real life experiences. The show is a kind- of like the dark side of Seinfeld. Like that show, Louie is built around clips of Louie’s stand-up performances. The performances serve as a framing device for the episode and usually pertain to what’s going on in the episode. Where Louie really departs from Seinfeld, which was a much more traditional sitcom, is that it is not situational and it’s not even always a comedy. That’s not to say funny stuff doesn’t happen on the show, or that Louie doesn’t find himself in some unusual situations. However, the show is more of a slice of slice where funny things happen along with the mundane, the tragic, and the downright depressing. While I found the first season to be more laugh out loud funny, the second season resonates more on an emotional level. Like the first season Louie is a single dad sharing joint custody of his two young daughters, Lilly (Hadley Delany) and Jane (Ursula Parker), with his ex-wife. The ex-wife is not a character on the show, but only referred to in passing. Louie is a devoted dad, but seem unsatisfied with his personal life beyond that. He has bad luck with his romantic relationships and is in love with his friend Pamela (Pamela Adlon), a woman who doesn’t feel the same about him. Louie is a series of vignettes encompassing Louie’s day to day life. Most of the time his life seems fairly ordinary. He takes his kids to school, he goes out on dates, and he does his stand-up. His life as a comedian is presented in such an unglamorous way his job seems as mundane as anyone’s. Louie is not a show that worries about complete storylines. Many of the episodes are little more than sketches. The episodes revolve around brief encounters or odd situations Louie finds himself in. Some of these ideas are hit and miss. An episode where Louie meets with some Hollywood executives to pitch film ideas was forgettable. Another episode featuring Joan Rivers is funny but ends unrealistically, taking away from the vérité aspect of the show. An episode where Louie takes his daughters to meet his 97-year-old aunt is not so much funny as it is squirmingly relatable. The aunt (Eunice Anderson) uses an offensive name for Brazil nuts making Louie and his daughters uncomfortable. It’s one of those awkward moments people can relate to even if they haven’t been in the exact situation. The downside to this episode is that more time is not spent with the aunt and Louie and the kids’ reaction to her. Instead there is a very long scene of Louie singing along with The Who’s “Who Are You” on the radio and the episode ends rather abruptly. It would have been nice to see just what kind of example Louie would have set for his daughters in dealing with his aunt’s offensive behavior. Despite some negatives to the season the show hits a lot of highs as well. There are some great moments where Louie deals with conflict between him and comedian Dane Cook. The episode where Louie is forced to call Chris Rock to rescue him from a bizarre encounter with a fan is a reminder of just how funny the show can be. The stand-out episode of the season is the double-length “Duckling.” This episode is funny and poignant at the same time. According to the credits the story was the idea of C.K.’s real life six-year-old daughter Mary-Louise. The episode was inspired by C.K.’s trip with the USO to Afghanistan. In this episode Louie finds himself caring for some ducklings his daughter brought home from school. After he travels to Afghanistan with the USO he finds one of the ducklings in his bag. His daughter Lilly had put it there for good luck. Louie cares for the duckling as he travels throughout the ware torn country. The episode is touching without being clichéd, and it makes good use of Louie’s humor. Overall I found myself having mixed feelings about this season. There were some genuinely funny moments, some heartfelt moments, and a lot of clever ideas. There were also some ideas that seemed to go nowhere, or were just not fully realized. At times the show was uncomfortable, like when Louie was dealing with a suicidal friend. Louie is a show that is not pigeon-holed into one genre. It’s comedy, drama, and whatever else comes into Louie’s head. Sometimes it works and sometimes it doesn’t. I suppose in the end that is what makes the show good. They aren’t afraid to put the unexpected out there. I didn’t enjoy every minute of it, but I was always looking forward to seeing what would come next. Season 3 of Louie premieres June 28th, 2012 on FX.